Limits opportunities to store and market pomegranates. Scald is a brown superficial discoloration restricted to the husk. There are no internal changes of the arils or the white segments as occurs with chilling injury. At advanced stages, the scalded areas became moldy. The scald symptoms became evident after 8 weeks storage at 2°C(36°F) on the cultivar ‘Wonderful'. Symptoms will appear earlier at higher storage temperatures. Husk scald development of pomegranate may be due to phenolic oxidation. Late harvested fruit is less susceptible than earlier harvested fruit. Scald development may be delayed up to 6 weeks on ‘Wonderful' stored at 2°C(36°F). Other potential treatments must be evaluated under California conditions before commercial recommendations can be made. Ben-Arie, R. and Or, E. 1986. 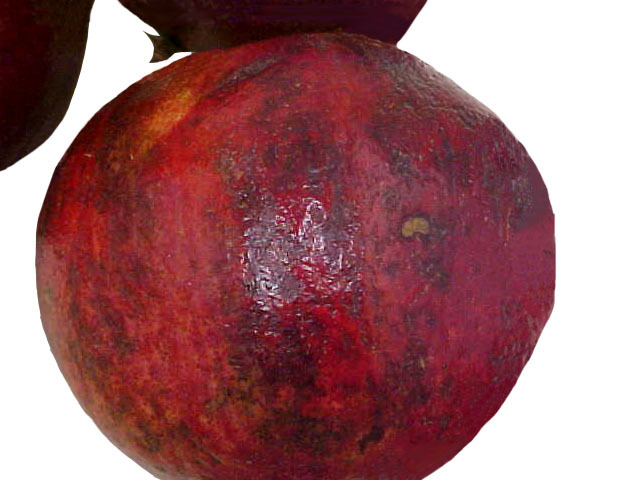 The development and control or husk scald on ‘Wonderful' pomegranate fruit during storage. Journal Horticultural of Science 111:395-399.